Damage or Decay: This issue is mostly found in repairing of structure. During the course and impact of time decay of structure may happen. If it is not possible to pull down the structure, then the structural repairing work should be undertaken. Construction Flaws: If the structural faults like honeycombs, voids, and excessive structural cracks or deflected structural members occur in newly built structures, then structural strengthening becomes necessary. Adding or Surge of Design Loads: It is applicable to those structures which require to modify the type of occupancy. Sometimes, these problems arise when new loads are employed to the structure with regard to the original load from where it designed for. Modification in Use or Codes: It is usually happened when the authority with the jurisdiction leads to examine the structures with the use of various codes even the structure is already constructed. As for instance, when the building on a specified area is actually designed for seismic zone 2A and due to the update in codes the authority directs an order to re-design it in seismic zone 2B, since the diversity strengthening is essential based on the design results. Slab Penetrations and MEP Rehabilitation: If the structure is exposed for slab opening demolition and MEP repair, the structural integrity will be in risk and it becomes necessary for strengthening requirements. Once the examination is completed and causes for strengthening are known, the perfect repairing method is chosen. 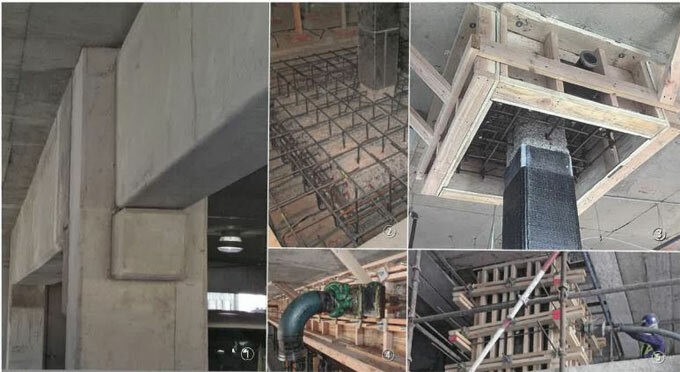 Concrete Expansion: It is considered as the general and conventional strengthening solutions wherein the structural members are expecting to raise its size to adapt whatever loads are required. But the problem is that excessive time is required for this purpose as well as considerable amount of space is occupied in a specified area. Post-tensioning (External, Encase Core): Under this method, pre-fabricated members are utilized to attain the necessary strengthening. But the cost is too high to undertake this method. Supplemental Steel and Plate Bonding: Under this system, a steel plate is added to the member concrete or steel to arrange supplementary strength. FRP or Fibre Reinforced Polymer: FRP is now treated as mostly recognized method in strengthening of a structure. It is a very advanced system and under this method a particular fiber is used to wrap around or along the structural members for improving the strength. It can put considerable strength to the subsisting columns, beams, walls, and slabs. It can raise the axial, shear and bending strength of the structural members and enhances stiffness and ductility. The design code and standards for the design and construction of FRP or Fibre Reinforce polymer is accessible on ACI 440 and one can abide by ACI RAP-5 for the guide to concrete repair.